Selecting any of the boxes here and clicking "Go" will limit the displayed memos to those matching your selected criteria. If you need a refresher on what each tag means, you can tap/hover over the question mark and it will helpfully tell you. Additionally, you can click on any of the tag prefixes displayed within the memo or the board listing to filter for that specific tag. 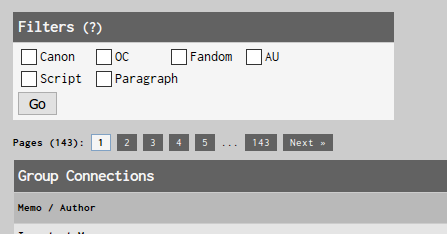 You can go back and edit your original post to add or change tags retroactively.